Length of base is 70 mm, height and length of top is 100 mm. Blue lines indicate upper limit for position of CG for the crawler to be stable. 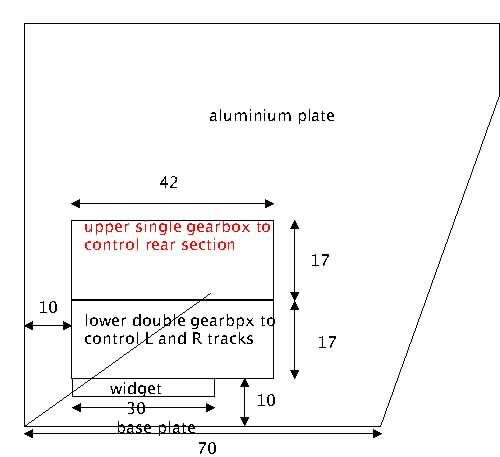 double gearbox consists of 2 single gearboxes fixed on a plastic widget. (x,y) = (0,0) at bottom left corner of trapezium. assume all positions are at z = 0. If we reduced the height of the crawler to 50 mm, the immediate advantage is the reduction in weight. However, the y-bar will only be lowered by 3 mm. In the excel file, do experiment with the position of the payload. Details of the payload are as follows: Mass: 50 g Shape: cylinder, of 25 mm diameter and 49 mm length. Kian Lee suggested moving the lower gearboxes to power the front wheels instead of the rear wheels. 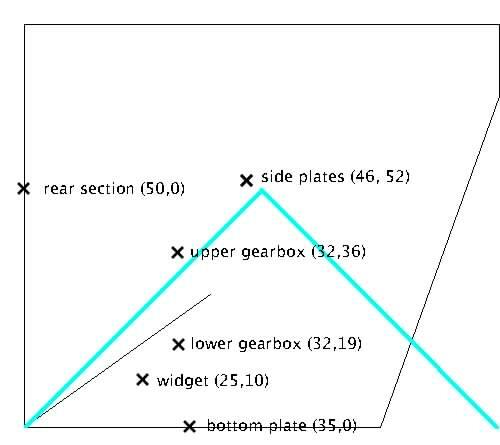 The new position of the CG of the lower gearboxes will be (48,19). Didnt manage to weigh the base plate, so i assumed it to be 25 g.
Our aim is to achieve x-bar to be as close to 35 as possible (half the length of base, ) and y-bar as low as possible and never to exceed the value of x-bar.